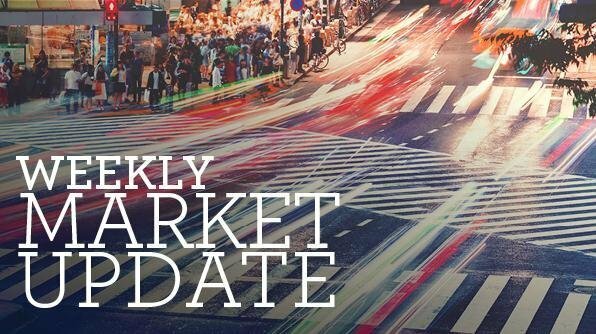 The past week saw most global share markets rise as Turkey slipped out of the headlines, but Australian shares were hit by political uncertainty. Bond yields fell a bit in the US and Australia, were unchanged in Japan and were up a bit in Germany. Oil and metal prices rose but the iron ore price slipped. 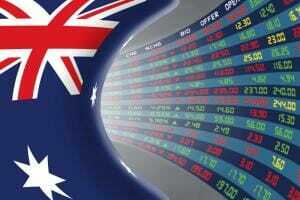 While the US dollar slipped as safe haven demand slowed, political turmoil weighed on the Australian dollar. Yet another PM in Australia, with Scott Morrison defeating Peter Dutton who had brought on a challenge to replace Malcolm Turnbull. All of the last four elected PMs have now been deposed by their own party and this is the sixth PM this decade, so we have now caught up to Italy. 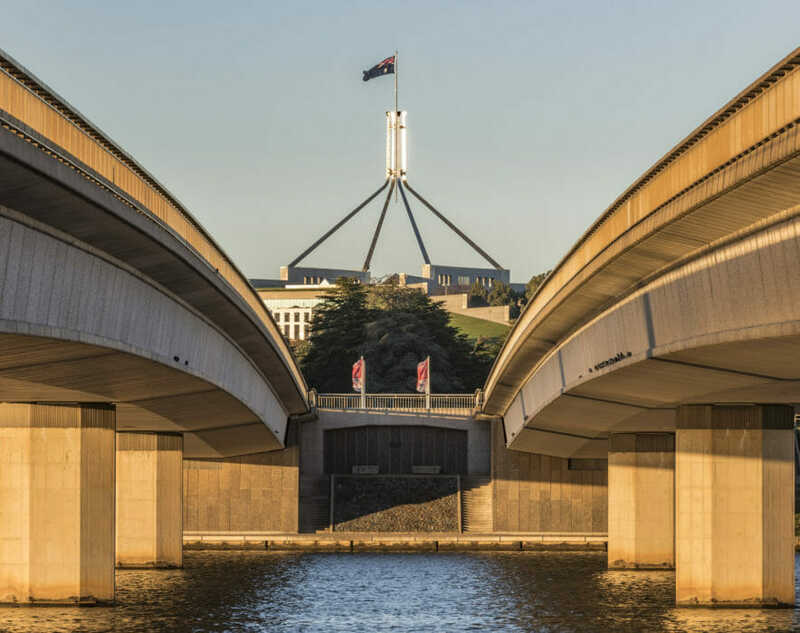 The turmoil is not great for Australia and has also seen investment markets start to get nervous about the coming Federal election. Of course, it’s dangerous to overstate the impact of the periodic bouts of leadership instability in Canberra seen this decade on the economy. It seems that as the “Lucky Country” the economy still manages to muddle along despite the mess in Canberra and I doubt that the latest leadership turmoil will change things that much. However, Australia should be able to do much better and the lack of durable leadership along with the problems in the Senate are making it harder to undertake serious productivity enhancing economic reforms and contributing to policy uncertainty, most notably around energy policy which has led to world beating electricity prices. More specifically, there are several implications from the latest change. First, Scott Morrison winning the vote is a reasonably good outcome from an economic and investment perspective. He did not bring on the challenge so can’t be blamed for the instability. More importantly he is seen as a reasonably sensible policy maker, is respected by investment markets in his role as Treasurer and is seen as a centrist giving the Liberals perhaps a better chance of victory in the coming Federal election. This probably explains why the share market and the $A had a bounce on the news that he will be the new PM. Second, while he will probably continue with the Government’s existing budgetary strategy the abandonment of the policy to cut the tax rate for large companies along with the budget coming in a better than expected does provide scope for earlier and bigger tax cuts for low to middle income earners which could help economic growth. 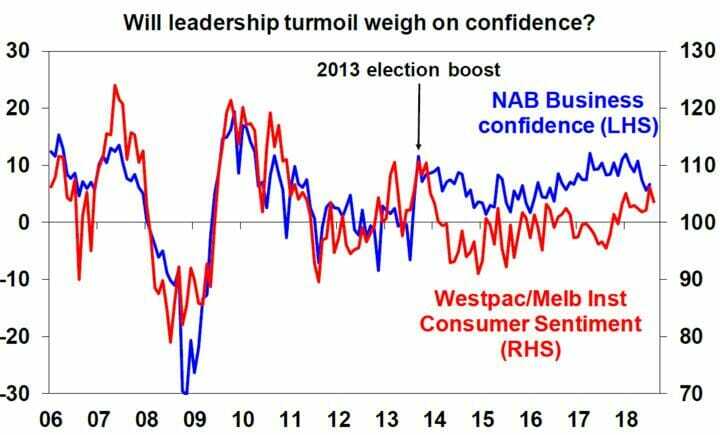 Third, the latest leadership turmoil and Scott Morrison’s relatively low margin of victory (of 45 to 40) still poses the risk that there may still be more turmoil ahead, all of which could weigh on consumer and business confidence just as it did under the last Labor Government. The LNP victory in September 2013 provided a confidence boost as Australians’ looked forward to relative stability after the leadership turmoil of the Rudd/Gillard/Rudd years, but with instability clearly continuing confidence risks being eroded again. 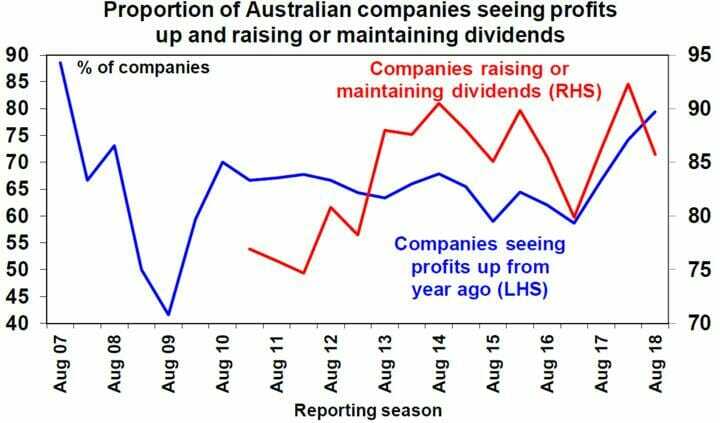 Business confidence is most at risk given the abandonment of the policy to cut the large company tax rate. 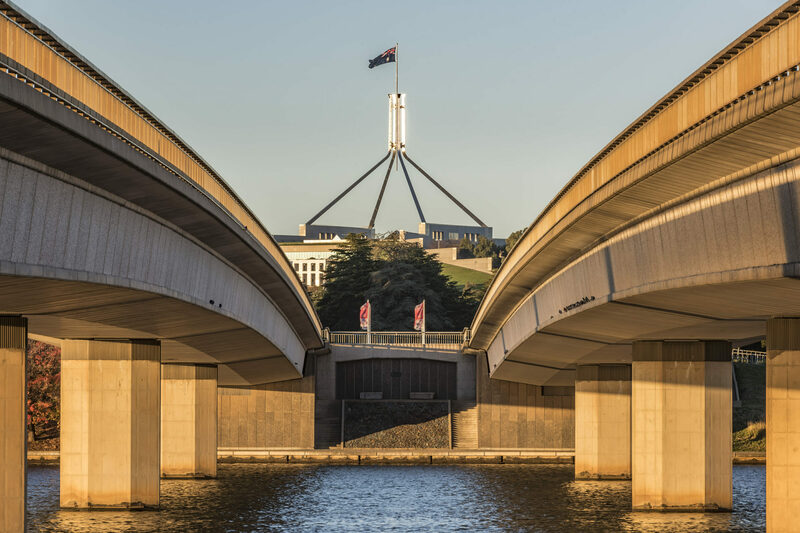 Finally, the leadership turmoil and Labor’s lead in opinion polls has focussed attention on the next Federal election and the likelihood of a change in Government and this has weighed on the share market and the Australian dollar over the last week. To keep Senate and House of Representative elections in alignment the election needs to be no later than May but if the new PM sees a bounce in poll support it could come before the end of the year. Labor’s main policies are increased public spending in areas Iike health and education, lower taxes for low to middle earners but higher taxes for high income earners, halving the capital gains tax discount and restricting negative gearing for residential property going forward to new properties and it would possibly adopt a tougher regulatory stance in relation to the banks, energy supply and industrial relations. The tax cuts would provide a boost to consumer spending, but the risk is that business confidence may dip which could hit business investment and the housing market could take a hit from the negative gearing and capital gains tax changes at a time when it is already down. The latter, particularly if combined with cuts to immigration, risks resulting in a sharper top to bottom fall in home prices than we are assuming (a 15% decline for Sydney and Melbourne and 5% nationwide) which would be negative for banks and consumer spending. 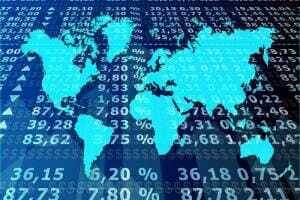 As evident over the last week, political instability and more specifically uncertainty around a change of government is likely to weigh on bank, consumer and energy shares and possibly also the Australian dollar as it risks adding to the forces already keeping interest rates down. The longest US bull market in history or is it and does it matter? There has been lots talk lately that the current bull market in the US S&P 500 is the longest in history, but a lot depends on how a bear market is defined. If its just a 20% fall then the last record bull market started in October 1990 and ended in March 2000. But I tend to see a bear market as a 20% fall that’s not reversed within a year and on this basis 1990 was not a bear market as the fall was quickly reversed and as such the record started in December 1987 and ran to March 2000 and its still a long way from being surpassed. Alternatively, if the 1990 US share market fall is a bear market then the share market slump of 2011 which saw US shares fall 19.4% on a daily closing basis but 21.6% on an intraday basis should be treated as a bear market too in which case the current bull market is still a long way from any record. Its all semantics really as history tells us that “bull markets don’t end of old age but exhaustion”. Trade threat rolls on with the US and then China imposing 25% tariffs on another $US16bn of imports from each other as scheduled and little progress in the latest trade talks between the US and China. The focus will now shift to the proposed US tariffs on another $US200bn of imports from China next month. With both sides still dug in for now its hard to see much progress until after the mid-terms. Trump’s legal problems are not yet terminal, but they are still escalating. The conviction of his former campaign director (Manafort) and his lawyer’s (Cohen) admission of campaign finance violation and claims that it was at the direction of Trump up the pressure but the former’s crimes appear to have nothing to do with Trump and the latter is probably not significant enough (campaign finance violations usually result in just a fine) to move the Republican controlled House to impeach (although this may change if Democrats get control) let alone reach the 67 votes in the Senate to remove Trump from office (even after the mid-terms). However, the threats to Trump are clearly escalating. Its unlikely to impede policy making in Washington, but it does run the risk of Trump doing even less considered things to shore up his base and the risk that he will seek to close down the Mueller inquiry (which would be an admission of guilt if ever there was one). Whatever, it all remains a potential source of volatility for markets that could intensify in the months ahead. This is a fantastic little video on a guy called Bob who knew a little bit about life. He was a near neighbour who unfortunately passed away doing what he loved in the last week. I doubt he spent too much time worrying about Trump’s latest tweets or leadership turmoil in Canberra! In the US, the minutes from the Fed’s last meeting remain consistent with the Fed being aware of risks around trade, emerging markets and the yield curve but no sign of deviating from the process of rate hikes every three months – at least for now. US economic data was mixed with falls in homes sales and a dip in business conditions PMIs, albeit to still strong levels, but continuing gains in home prices and ongoing very low jobless claims. Eurozone business conditions PMIs were basically stable in August – up a bit for services, down a bit for manufacturers – suggesting that growth has stabilised at a still reasonable level after slowing earlier this year. It’s not enough for the ECB though given still low core inflation and threats from emerging markets and Italy. Japan’s core (ex-fresh food and energy) inflation rate rose to 0.3% year on year in August from 0.2%, which is good but far from being enough to move the dial for the BoJ. Australian construction data surprised on the upside in the June quarter and will help June quarter GDP growth. The growth came from dwelling investment and public engineering. Looking forward dwelling construction will slow as approvals are off their highs, non-residential approvals also point to constrained non-residential building, but public infrastructure spending is likely to keep overall construction rising – just not as fast as seen in the June quarter. Meanwhile skilled vacancies rose slightly in July but the pace has slowed. 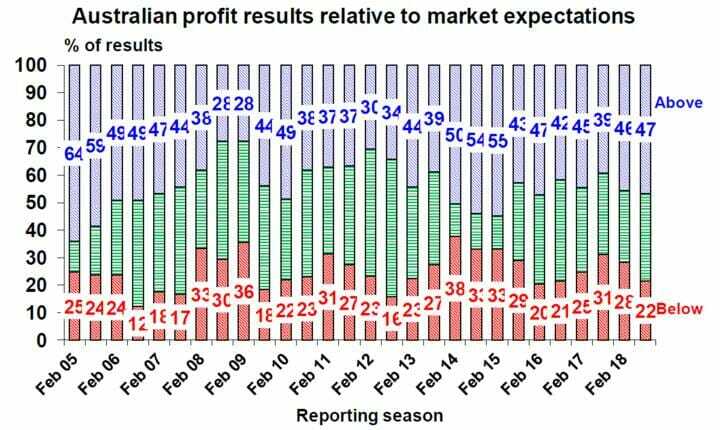 The June half Australian earnings reporting season is now around 85% done and results have proved to be pretty solid. 47% of results have surprised on the upside compared to a norm of 44%, the breadth of profit increases is high with 79% reporting higher profits than a year ago compared to a norm of 66%, 86% have increased their dividends or held them constant and 65% of companies have seen their share price outperform the market on the day results were released. 2017-18 earnings growth are on track to come in around 9%, with resources earnings up 25% thanks to solid commodity prices and rising volumes and the rest of the market seeing profit growth of around 5%. In the US, expect to see a continuing gain in home prices and still solid consumer confidence (Tuesday), a small gain in pending home sales (Wednesday), a solid rise in July personal spending and a lift in inflation as measured by the core private consumption deflator to 2% year on year (Thursday). In the Eurozone expect unemployment for July to remain at 8.3% and August core inflation to remain at 1.1% year on year with both to be released Friday. Economic confidence data will also be released. Japanese data to be released Friday is likely to show continued labour market strength but flat industrial production. Chinese business conditions PMIs for August (Friday) will be watched for any slowing that may be related to tighter non-bank lending conditions and trade war worries. In Australia, June quarter business investment data to be released Thursday will help firm up expectations for June quarter GDP data to be released in early September and provide a guide to business investment over the year ahead. We expect June quarter investment to rise 0.8% and business plans for this financial year to rise slightly. Meanwhile July building approvals (also to be released Thursday) are expected to fall 5% after a strong rise in June and credit growth (Friday) is expected to remain modest. The Australian June half earnings reporting season will wrap up with 24 major companies accounting for around 5% of market capitalisation reporting including Spark Infrastructure (Monday), Caltex, Boral and Blackmores (Tuesday), Bellamy’s (Wednesday), Perpetual and Ramsay Health (Thursday) and Harvey Norman (Friday). While we see share markets being higher by year end as global growth remains solid helping drive good earnings growth and monetary policy remains easy, we are likely to see ongoing bouts of volatility and weakness as the US driven trade skirmish with China could get worse before it gets better and as worries remain around the Fed, President Trump in the run up to the US mid-term elections, China, emerging markets and property prices and election uncertainty in Australia. The August to October period is well known for share market falls and volatility. National capital city residential property prices are expected to slow further with Sydney and Melbourne property prices likely to fall another 10% or so, but Perth and Darwin property prices bottoming out, and Adelaide, Canberra and Brisbane seeing moderate gains. We continue to see the $A trending down to around $US0.70 as the gap between the RBA’s cash rate and the US Fed Funds rate pushes further into negative territory as the US economy booms relative to Australia. Solid bulk commodity prices should provide a floor for the $A though in the high $US0.60s. 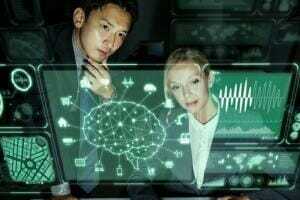 Original Source: Produced by AMP Capital Ltd and published on 24 August 2018. Original article. Do I need an accountant to do my tax return? 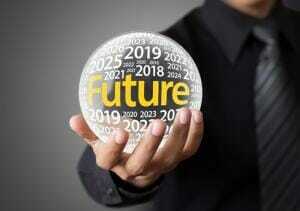 Next PostWhat is financial planning?